Imagine writing a flyer in June for a political comedy show in August. What’s Britain even like now? Did we really Brexit? Has joy been privatised? Is Theresa May our Prime Minister? Oh god. Oh god no. Say it ain’t so. 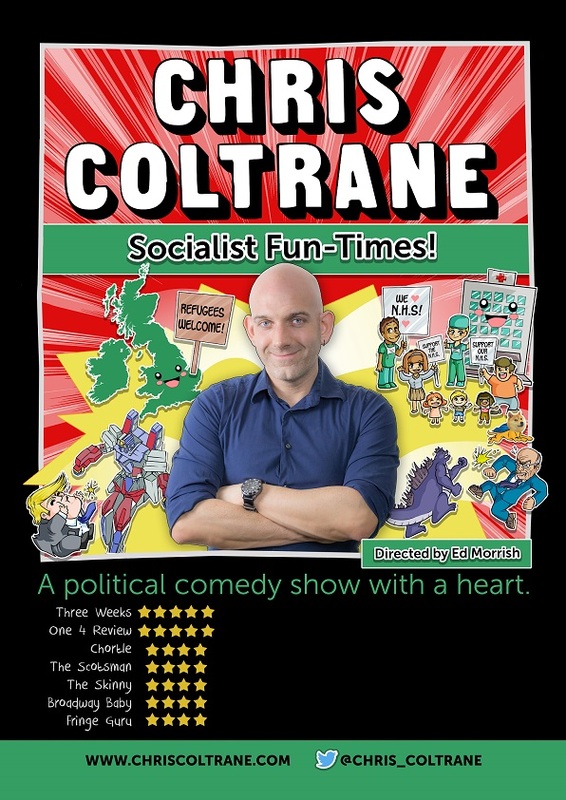 Well, if the world seems bleak, don’t despair: Chris Coltrane is back with another hour of hilarious, Tory-smashing stand-up comedy to inspire and delight. If you like social justice, kindness, libraries and joy, Coltrane has a show for you. In Socialist Fun-Times, comedian and activist Coltrane (“Josie Long’s favourite comedian on Twitter”) tries to find even a shred of optimism in this distinctly broken country. In a world full of Farage and Trump, Chris has the antidote. Along the way he champions political correctness, defends refugees, and asks why we can’t have Easter Eggs all year round. You’ll leave happy or hungry. Either way, Coltrane will consider it a victory. Fans of intelligent nonsense will love Coltrane’s fifth stand-up show. Come and see this comedian who The Guardian once described as “Exactly as good as Monty Python*”! * Four years ago The Guardian gave my debut show a three star review. Two years ago they also gave Monty Python Live a three-star review. So basically, what The Guardian is saying is that I’m exactly as good as Monty Python. Shut up, that IS what it means. This entry was posted on July 20, 2016, 21:52 and is filed under Skeptics in the Pub. You can follow any responses to this entry through RSS 2.0. You can skip to the end and leave a response. Pinging is currently not allowed.